1 What is a credit dispute letter? 2 Do credit dispute letters work? 3 Can I dispute my credit reports online? 4 Can I dispute my credit report over the phone? 5 What items can I dispute on my credit report? 6 Who should I contact first, the credit bureau or my creditor? 9 What if my creditor doesn’t follow through? 10 Make Sure You Know What You’re Doing! 11 How can a professional credit repair company help? If you don’t agree with the information contained on your credit report you can send a credit report dispute letter to each of the 3 credit bureaus. You can even dispute any items that you find “questionable”. 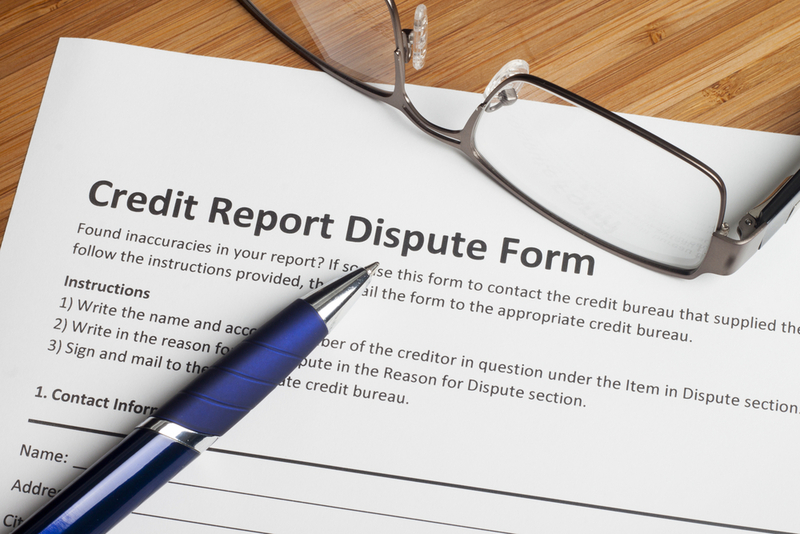 By disputing an item, the credit reporting agencies are obligated by law to investigate. They must either verify, correct, or delete the item from your record within 30 days. This type of letter is called a credit dispute letter. You can also send dispute letters directly to your creditor. Do credit dispute letters work? Absolutely! If they are written correctly, they can be highly effective in removing negative items from your credit reports and fixing bad credit. Whether you take on a DIY approach or hire a professional credit repair company, you can see positive results as long as you execute the process in the correct way. To help, we’ve developed a step-by-step guide to dispute letters so that you can optimize your chance for success. After all, disputing errors on your credit reports is your legal right. It’s important to go about it in the right manner so that you don’t lose the opportunity to repair your credit using this method. Yes, all three of the major credit bureaus (Equifax, TransUnion, and Experian) offer online dispute forms on their websites. However, we highly advise against disputing online because it’s not as effective. It limits your rights, gives you less control, and you’re doing exactly what the credit bureaus want you to do. You’re playing into their hands and giving them the easy way out when you dispute online. Yes, you can still have some success in removing negative items by disputing online. However, it is NOT the best way. Why? The primary reason is that you may inadvertently waive some of your rights under the Fair Credit Reporting Act when you choose to file a dispute online. Unfortunately, many people dispute online because some of the big “consumer advocate” sites like Credit Karma and Credit.com advocate it. Even The New York Times wrote an article encouraging it. There is plenty of misinformation online about credit repair and it’s placed there on purpose. Be careful of websites that pretend to try to help you, but are actually hurting your chances of raising your credit score while simultaneously helping the credit bureaus. Credit repair experts NEVER dispute their clients’ credit reports online. They know it’s a big no-no. Please don’t be lazy if you’re going to repair your own credit; write a dispute letter. That way you can retain copies as proof that you sent the letter. You should also send it via certified mail and request a return receipt. This also serves as evidence that the letter was received starts the 30-day clock for the credit bureau to investigate the dispute. Can I dispute my credit report over the phone? Yes, you can do your disputes over the phone, but again, it’s not a wise decision. It’s almost as bad as disputing online because there is no paper trail to confirm your actions. If you want the best chance of getting negative items removed from your credit reports, write a letter and keep careful records of all communications you send and receive from both creditors and the credit reporting agencies. What items can I dispute on my credit report? Be very careful that you don’t dispute positive items. Once they are removed, it’s pretty much impossible to get them back on your credit report. If you are not sure which items are negative and which are positive, you are not quite ready to send disputes to the credit bureaus yet. Make sure you completely understand what’s being reported on your credit history before starting the dispute process. Who should I contact first, the credit bureau or my creditor? We recommend contacting your creditor first because they are the original source of information regarding any negative items on your report. In this instance, it’s best to call them and try to get the error settled. Before you pick up the phone, gather all of your documentation supporting your claim that they have reported a negative item by mistake. This could include proof that you paid off any owed amounts or a letter from the creditor noting that you agreed to a settlement. Also, have on hand evidence of the error itself. In most cases, this is a copy of your credit report, but it could also be something like a letter from a collections agency for a bill you already paid. When providing copies of this information, just be sure to black out sensitive information like your social security number before sending it over. Once you have everything pulled together, send a dispute letter or make the call. You’ll have the best chance of success if you go in prepared so take a few minutes and pull your paperwork together. In your letter, identify the error on your credit report and note that you have circled the item in an attached copy for their reference. Also, list whatever supporting documentation you’ve covered and explicitly ask that the item is removed. Remember, the letter should be as customized as possible to achieve optimal results. In most cases, it’s unnecessary to mention laws, procedures, court rulings, or threaten lawsuits, etc. The credit bureaus know the law. Similarly, remember to be kind. Combative language doesn’t help and could hurt. You’re not going to scare the credit bureaus into doing anything. Include copies of information that supports your claims, but remember, anything you send them can also be used against you. Do not send original documents. Please be very careful with this one. If you’re not sure, don’t send it. Do not send original documents. Make and send copies, but always keep the originals for your own records. Make it clear which item or items you want to dispute. It’s not always necessary to tell them why you are disputing. The burden of proof is on them. Credit bureaus are not obligated to investigate requests that appear frivolous. Make sure your letter is understandable and concise. It’s a good idea to proofread the letter before you send it. Note: Always include a photocopy of your driver’s license, state-issued ID, or U.S. passport and a copy of your social security card, pay stub, W-2 or a recent utility bill. Only 2 forms of ID are required. Below is a sample dispute letter that can be used for an Equifax, Experian, or TransUnion dispute. Please remember that these letters are just examples. They are intended to give you an idea of what a dispute letter should look like and what it should contain. Tailor your message to your specific circumstances. It’s always best to write the letter in your own words and know what you are doing. If you don’t know what you are doing, it is possible to make your credit situation worse. Please provide evidence the following account belongs on my report and that my rights have not been abrogated. In the event that no record exists, please delete this damaging account information. Your report or confirmation number (if available). Note: The above letter works for all three credit bureaus. Replace the credit bureaus name & address based on the information listed below. What if my creditor doesn’t follow through? Unfortunately, it’s common practice for creditors to drag their feet when it comes to removing negative items. They do this especially if they’re trying to get you to pay off a debt you already settled in some way. At this point, it’s time to contact the credit bureaus, but make sure you contact each one that lists the offending error on their version of your credit report. Not only should you include a new dispute letter explaining your situation, you’ll also need to include a copy of the original letter you sent to the creditor, plus copies of your supporting documentation. If you’ve had additional contact with your creditor, such as a mailed response or any phone conversations, include that information as well. It’s all relevant and helps present a robust case to the credit bureaus. The more organized you are, the better chance you have of them realizing that you are the one being wronged and not the other way around. It also helps the credit bureaus conduct a quick and thorough investigation. Remember, they need to complete the entire inquiry within 30 days of receiving your letter so do your best to make their job easy for them. In most instances, if the creditor isn’t willing to cooperate, then the credit bureau will automatically remove the negative item from your credit report. But in the extreme case where you don’t get help from the credit bureau either, you may need to enlist legal help. It might be costly, so reserve this for especially damaging items. You might find success just by sending a letter on a lawyer’s letterhead. Make Sure You Know What You’re Doing! It’s imperative that you do this right as getting a home loan, car loan or even a new job can depend on how successfully you can clean up your credit report. We’ve heard of countless people who have made their credit even worse (in some cases much worse) because they didn’t know what they were doing. If you’re not careful, you can unknowingly undermine your consumer rights and do irreversible damage to your credit by trying to save a few bucks doing it yourself. Dealing with the credit bureaus and your creditors can be intimidating and the constant back and forth with them can be quite time-consuming and frustrating. They don’t always respond with the desired outcome, in which case, follow up letters are needed. How can a professional credit repair company help? As you can probably tell from the detailed instructions above, disputing even a single negative item on your credit report takes a lot of work. First, you have to correspond back and forth with your creditor. If that doesn’t work, you then have to reach out to each credit bureau separately. Since you need to do everything via snail mail to ensure you don’t waive any of your rights, doing things the right way still feels like the slow way. One way to speed up the process and save time is to hire a professional credit repair company. They know the letter of the law to a T and can navigate the process on your behalf in an agile and efficient manner. Working with a professional also takes the emotions out of the process. You simply get to check in with your contact to find out the status without having to talk to aggressive or irate creditors. If you want to make sure your credit repair gets done right, let the professionals at company like Lexington Law take care of it for you. They have dealt with hundreds of thousands of clients and their team of lawyers and paralegals have many years of experience. Plus, they know how to deal with the credit bureaus when they don’t respond favorably. Call 800-220-0084 for a free consultation and complimentary credit score.